After beating CSU and SDSU last week, BYU mens basketball was finally shown the love by pollsters. They are now ranked #3 in both the coaches and the AP polls, with an RPI of #1. How to get a straight paint line with heavly textured walls. One of the biggest problems I have had while remodelling my home is the heavy texture on my walls. When I would attempt to paint a nice straight line of color it would always bleed underneath the tape. Then I would have to come back with a straight edge and touch up the wall everywhere the paint would bleed. For a large wall its a very long and tedious process. The other day I decided to try something a little different. After applying the tape as usual, I also pulled out some Latex Caulk (it has to be paintable) and applied a very very thin amount to the seem of the tape, and then rubbed it in with my thumb to the point where the painters caulking is almost not even noticeable. 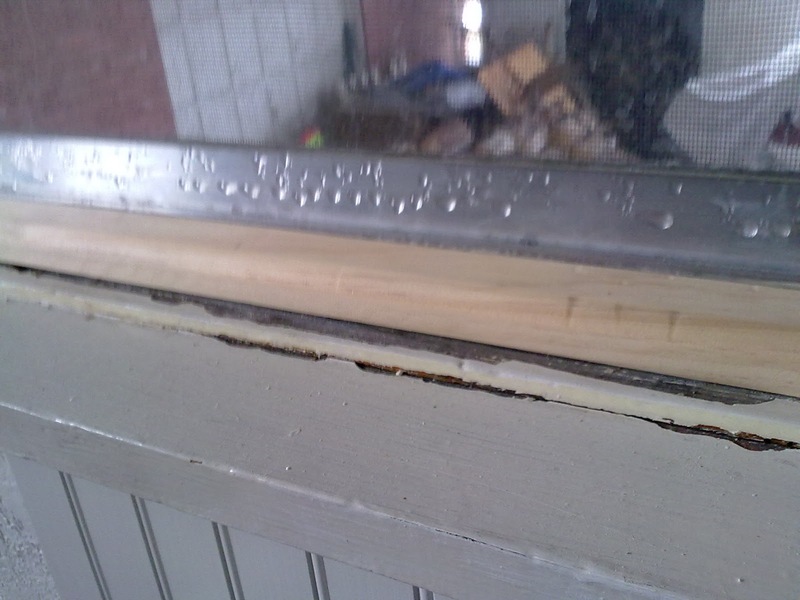 The idea is the the painters caulk fills in the gaps that the tape cannot. After the caulk dries (depending on the caulk you use this can be anywhere between 20 minutes and 2 hours) Apply paint as normal, and viola you will have a straight clean line, regardless of how textured the service. So when you need a clean straight painted line, take the extra time and use the caulk, and save time by not having to touch up your work when you are finished. Nothing makes a painted room look worse then messy crooked painted lines. UPDATE: So a friend of mine read this post and suggested another way to get clean straight lines. He told me that a painter friend of his applies the tape, then paints a small amount of the paint color that is underneath the tape. So on my cranberry/white wall if I would tape the white side of the wall, and then paint over the edge with the white paint. This allows for the white paint to bleed onto the white wall. Once its dry just paint the cranberry wall as normal. The white paint will seal the tape line (like the caulking) and you should end up with a beautiful straight clean paint line. Just got done watching the #7 BYU beat #6 SDSU. Congratulations to the Cougars for sweeping SDSU. They are the only NCAA basketball team this year to be able to beat the Aztecs. Here's to a #1 seed in the tourney. 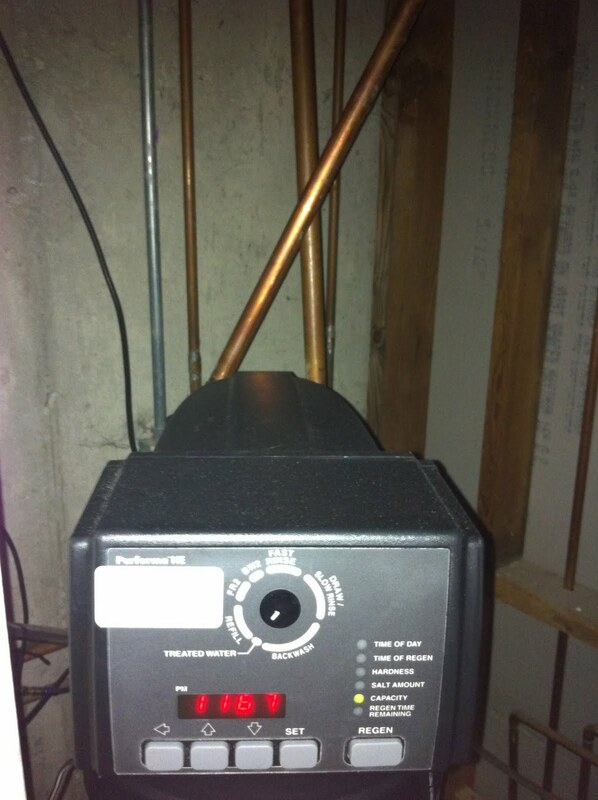 I am currently in the process of remodelling my laundry room. 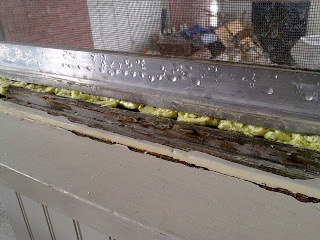 Because its an older house (built in 1922) nothing is standard and I find myself coming across unique issues all of the time. Today's unique issue was that one of the windows had a non standard window sill. As you can see in picture 1, I had to fill the gap with expanding foam, but there was still a 3/8 inch lip that I needed to cover. Who ever installed the window the first time, put a 1/4 round molding on the top of it, and then used putty to fill in the gap. I though about doing the same thing, but decided to pull out the trusty router and make a piece of custom molding for it instead. 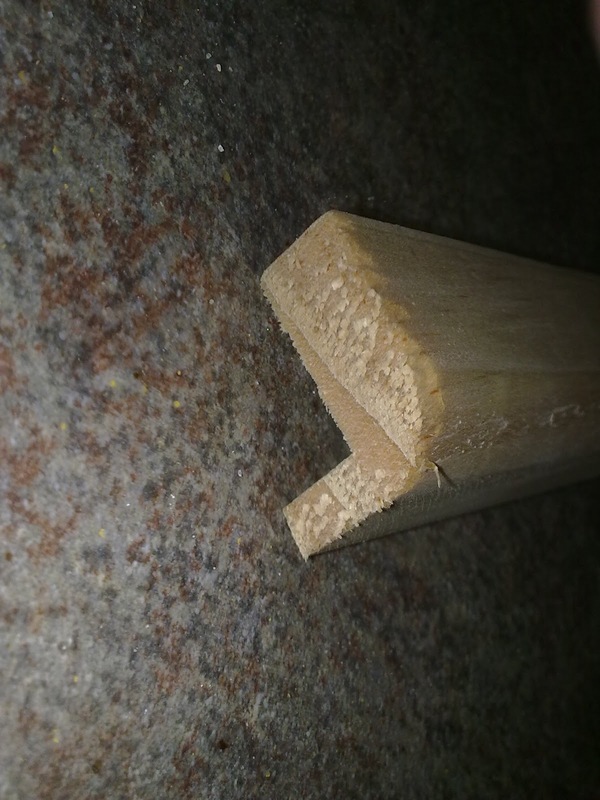 I took a 2x1 inch board, and ripped it on my table saw to a 1x1. I then routed out the bottom using a 3/4 inch router bit, to accommodate for the odd size lip on the sill. Finally I put a 3/4 inch round end on the top to give it a nice smooth round finish. The finished product fit wonderfully, and looks much cleaner than a 1/4 round molding piece with a bunch of putty would have looked. 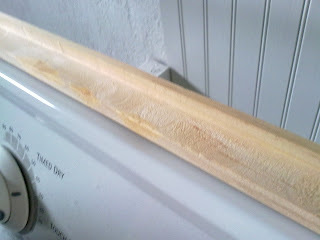 Close up of the finished molding. How I ended up sporting a Mohawk. After pre-drilling all of the holes for the mounts, and putting anchors in, we anchored one side in while my brother was hooking up the wires to the electronic ballast. I jumped down from the step ladder I was on to move it to the next mount hole when BAM! I was smacked in the head. At first I was a little stunned, but then I realized that the light had pulled itself from the ceiling, anchor and all (wussy anchor.) I grabbed my head where I was hit, and applied some pressure. My brother wanted to see what the damage was, and when I removed my hand it was covered with blood. My first concern was the amount of hair that was in my hand, seeing that these days hair is a rare commodity for me. Even though the picture doesn't show it, the side panels of the lights when both the lights and ballast cover are off, are very sharp. 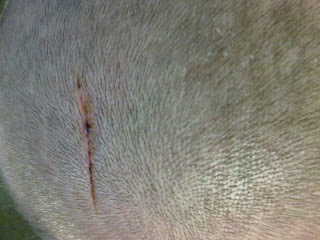 As you can see in the photo it left a pretty good gash in my head. After putting a couple of paper towels on the wound to help stop the bleeding, we got back to work and finished installing the lights. 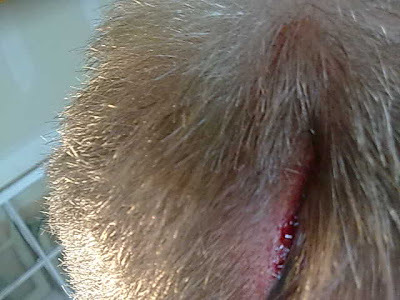 There were mixed feelings on if I should got to the ER to get some staples put in my head, but in the end I decided it wasn't worth the $1,200 bucks it was going to cost me. I ended up going home and with the help of my wife, I was able to get my head bandaged up. 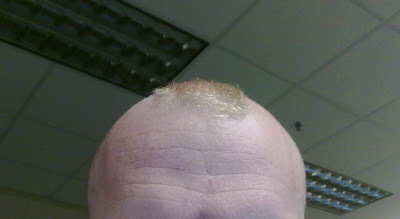 Which leads me to why I now have a mohawk. In order to apply a couple of butterfly bandages I needed to clear some space around the wound (as you can see it already had a pretty good size bald spot) so we shaved some more hair off. 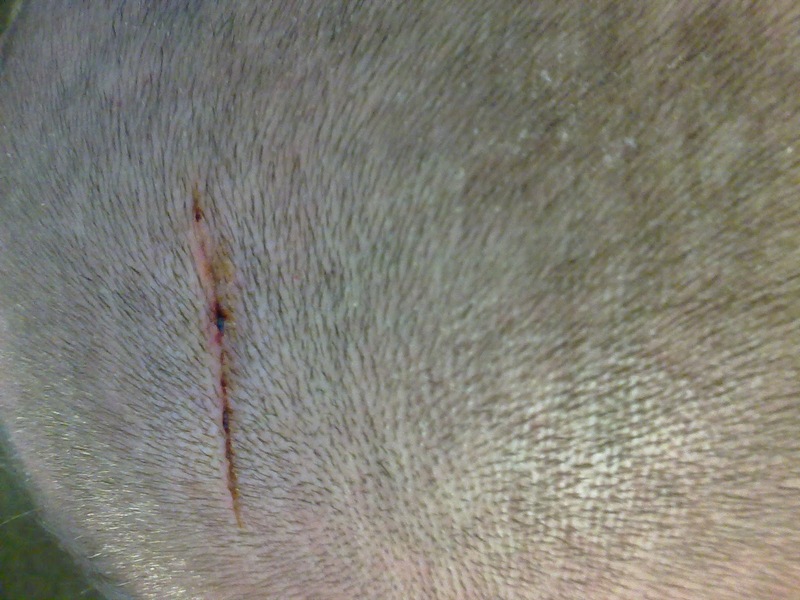 Now I there was a very big bald spot. So instead of shaving my whole head I decided to just make a mohawk out of it. Now after 4 days of healing this is what it looks like. Even though I probably should have gone to the ER and gotten staples I think my wife did a pretty dang good job at bandaging it up. I might even only end up with only a small scar. You can see I had to switch the pipes coming in from the back. 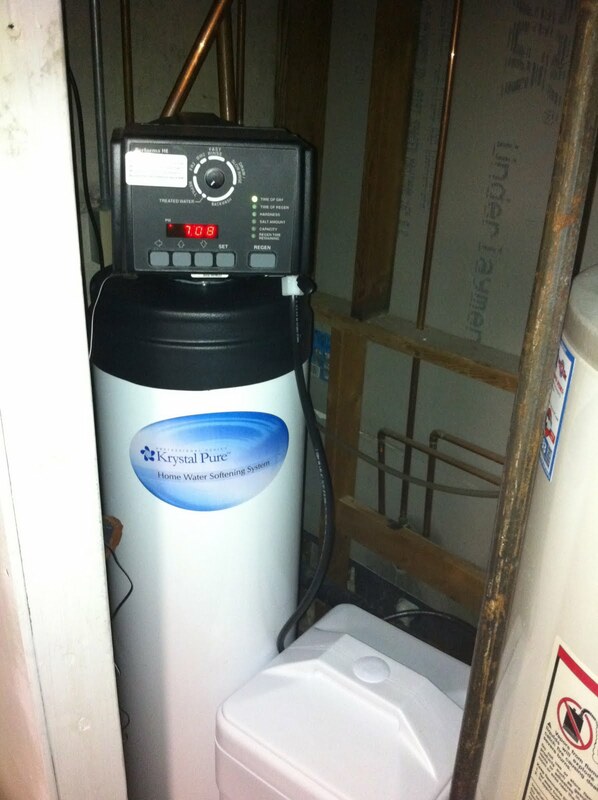 Of course the new softener was opposite the old. Yesterday as I was eating at Honey Baked Ham in Orem, I asked the girl if she had straight up yellow mustard and she said "you mean the wussy plain stuff?" She told me I needed to try the honey spice mustard. I decided I needed to man up and try this new mustard instead of my traditional wussy yellow. To my surprise it was actually pretty good. I felt like I had to try it especially because she was calling me a wuss if I did not.